Contact us directly for actual tour price. Let us know how many persons travelling with you to caltulate best possible price. In the morning after breakfast we depart to Ifran and we explore cedar forests ,here we will stop for a while to enjoy seeing monkeys climbing the trees.Then we will have lunch in Midelt, “the apple capital”, at the foot of the Ayachi Mountain. 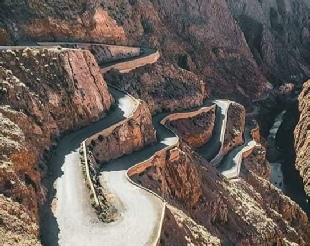 Then we continue over the Tizi-n-Talremt pass and through the Ziz Valley, which is particularly well-known for its palm trees and the length of the oasis. All along the road there are innumerable “ksars”, small villages of individual houses. 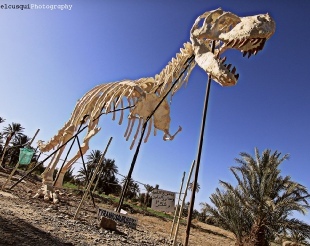 From here we head to Er Rachidia and then Erfoud, famous for its date festival and fossils. 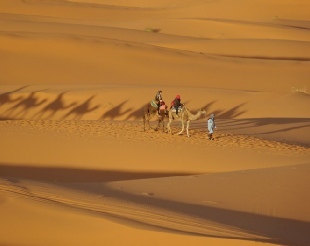 We arrive to Merzouga to enjoy unique dunes, and the rest of the day will be dedicated to appreciate the evening change over the dunes. Night in desert riad. 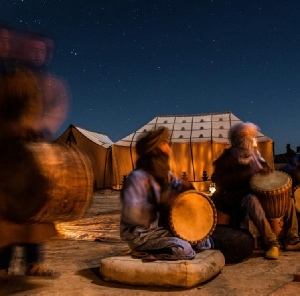 After breakfast we head to Khamlia village to enjoy live Gnawa music, we continue through an off-road to have a tour of sand dunes then stop to have a tea with nomads in Berber tents and you will discover a new sense of life. From there we drive back to the hotel to relax before we start our camel trip into the middle of the dunes to see the sunset. 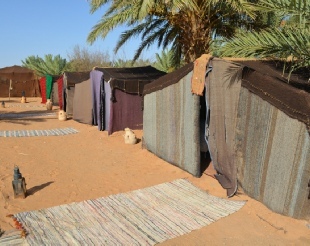 Then we arrive to the bivouac where we spend the night under nomad tent. We wake up early to watch sunrise, when the colour of the dunes and the play of shadows are an awesome sight. Then we arrive to the hotel to have breakfast and shower. 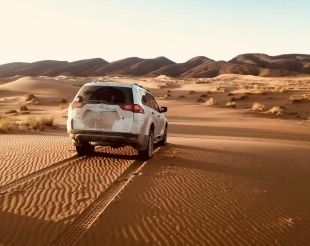 We continue to Ouarzazate via Rissani and we will stop in Erfoud: famous for its fossilized marbles where you will visit the workshop production of marble fossils. Then we continue to Todra Gorges its an ideal place for walking and exploring in your own. 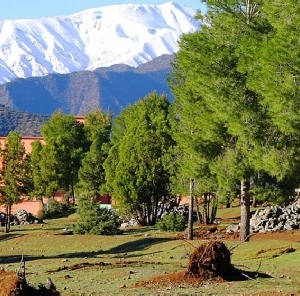 We will have lunch here and then we drive through Dades valley and the town of roses, Kelaa Mgouna and we continue through the Road of Thousand-Kasbah passing Skoura palm grove until we arrive to Ouarzazate named “Hollywood of Morocco” ,where we stay overnight. Today we will visit Aït Benhaddou, a ‘fortified city', situated along the former caravan route between the Sahara and Marrakech. 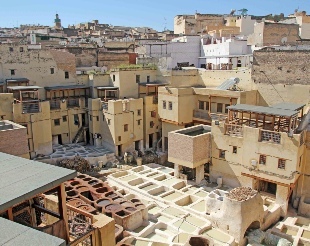 It is situated on a hill along the Ouarzazate River and boasts some beautiful examples of kasbahs, some of which remain inhabited. Granted UNESCO World Heritage listing, the site had been the setting for many films including Lawrence of Arabia and Gladiator. After stop for lunch we continue to Marrakech over the high Atlas mountains. Morocco Desert Trek driver will drop you off at your hotel. End of Fes desert tour. 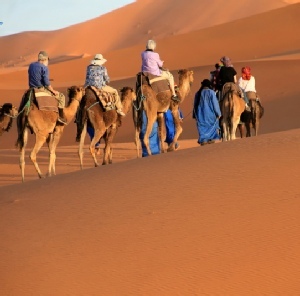 This Private Morocco tour to Sahara desert can be modified depends on your travel plans and Requirements.  The tour price will be MODIFIED DEPENDING on those changes. 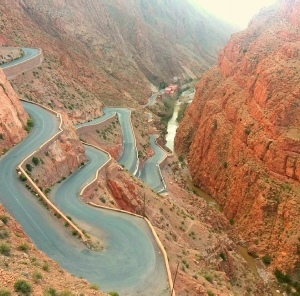 if you have your own Morocco circuit ,with hotels booked, we can only organise comfortable transport and guide for You. 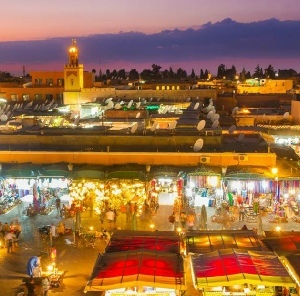 Private Tour in comfortable vehicle (there will be no more people in the group) , Pick up from your hotel / riad / airport or wherever you want , Accommodation with half board in hotels / riads. 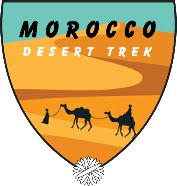 (a room + breakfast + dinner) , Air-conditioned 4x4 or minibus vehicle , Experienced English speaking driver during your private Morocco tour , Camel ride to and from Merzouga desert camp. 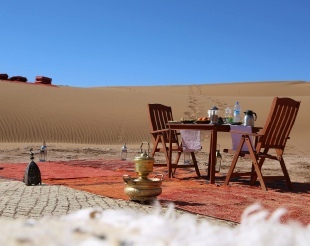 (1 camel per person) , 1 night in Merzouga desert camp in the dunes with dinner and breakfast. 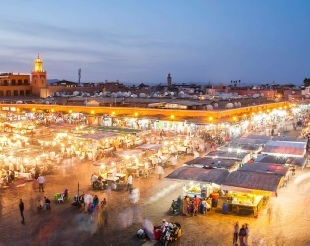 Flights to / from Morocco , Accommodation in Fes , Lunches , Soft Drinks , Entry fees & Tickets , Tips and what's not in the program. 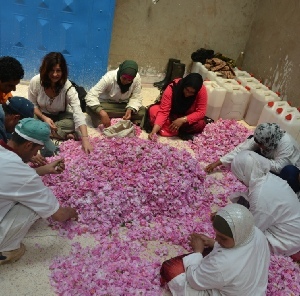 The private Fes private tour is available every day during the whole Morocco travel season. 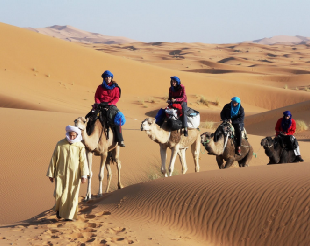 Please contact us for best price for your selected Fes to Erg Chebbi trip with comfortable transfer and reservation. 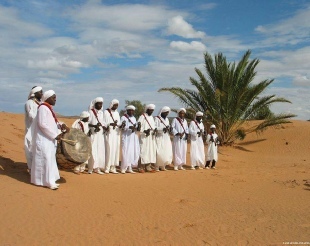 We Organize Everyday trips To Sahara Desert in Erg Chebbi. 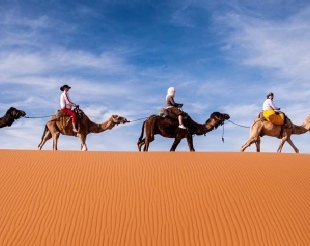 Contact us to prepare for you amazing Fes to Desert holiday , with camel ride in Merzouga and very Comfortable travel in A/C vehicle. 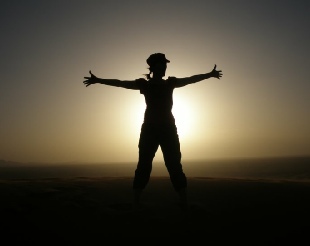 You Explore Best of Atlas mountains , we explore Sahara Dunes in 4x4 Travel and You spend Amazing time in camp.